Wireless controls system with LED dimming features. New LoRaWAN controls launching end of year 2017! 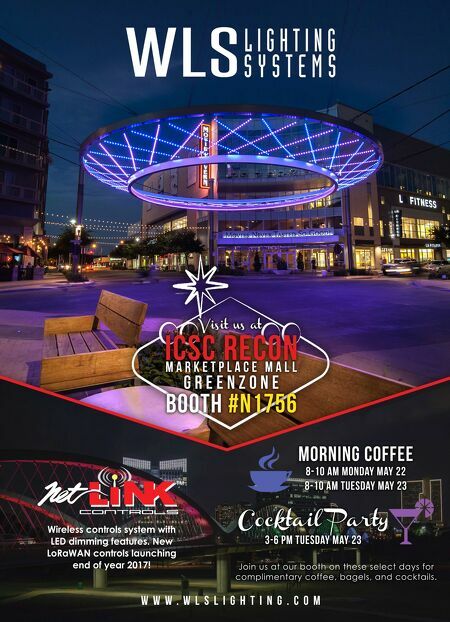 Visit us at ICSC RECON M A R K E T P L A C E M A L L g r e e n z o n e BOOTH #N1756 w w w . w l s l i g h t i n g . c o m Cocktail Party 3-6 PM TUESDAY MAY 23 MORNING COFFEE 8-10 AM MONDAY MAY 22 8-10 AM TUESDAY MAY 23 Join us at our booth on these select days for complimentary coffee, bagels, and cocktails.